Lead by the journalist Michael Braun, about 100 citizens discussed together with PlastX researchers Dr. Johanna Kramm (ISOE), Dr. Carolin Völker (ISOE) and Dr. Frederik Wurm (Max Plank Institute for Polymer Research) and Isabell Kuhn quality management manager at Alnatura and living plastic-free blogger Andreas Arnold (author “plastics diary”-blog) about plastic usage in everyday life. A graphic recorder visualized the discussion of the evening. By the end of the night, the bottom line was that production and consumption patterns need to be changed each in order to keep the ecological and economic costs of plastic- use in check. All participants agreed that the burden to reduce plastics in our daily lives has to be shared between all players: producers, retailers (grocery stores etc.) and costumers. This also includes a much better flow of and access to information to costumers, for example in stores, to what actually is sustainable and what is not. Here you find more information on the discussion (in German). 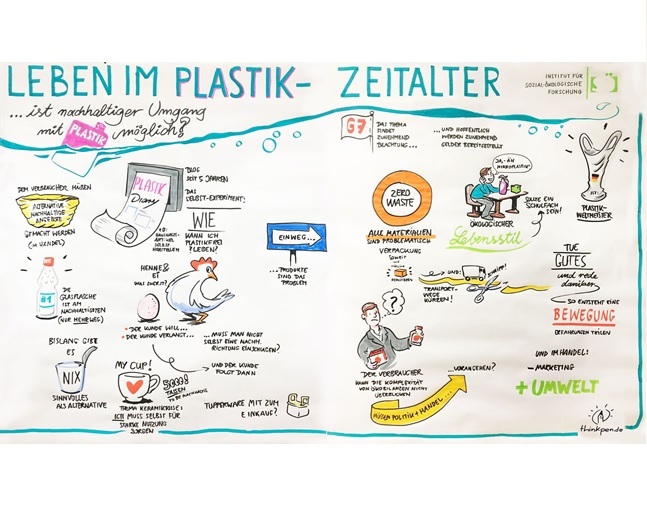 Deutschlandfunk, Umwelt und Verbraucher, 29.06.2018 Ist ein nachhaltiger Umgang mit Plastik möglich?